This post is by Jess. Yes. I LOVE visiting teaching. Am I good at it? Not at all. But I love it. In the last few years, I've had a major paradigm shift when it comes to visiting teaching. I'm way less nervous when I get handed a new assignment. I am not at all worried about coordinating a time to get together with my companion and those we teach and who is going to teach the lesson. What is visiting teaching? Visiting teaching is an organized watchcare system for the ladies 18 and older in any given LDS ward or branch. Two sisters are asked to watch after the needs of one sister. If there are any concerns, a visiting teacher would report that to any leadership. The work of the Mormon church is based on meeting the needs of individuals. I've come to realize that Visiting Teaching assignments are an invitation to bring another individual into my life. And I can do that. What are my favorite things to do with my visiting teachees? The exact same things I like to do with my friends. I like going on walks. I like getting frozen yogurt. Do we talk about the Gospel? Yes! Do I teach a formal lesson? Rarely. Are we assigned friends? Absolutely! But that doesn't mean it has to stay that way. Do I only visit teach once a month? Hardly. Would I only hang out with my friends once a month? Do I ever say, "If you need anything, let me know." NEVER! What kind of friend needs to ask what they can do? If I ask that question, then I know I don't know the person well enough and I need to spend more time with them. Have I seen miracles when it comes to visiting teaching? Yes. But mostly the miracles have happened in my life, because I'm a visiting teacher. I've become more caring, I've become more attentive to the needs of others. I've learned to pray more earnestly on the behalf of another person. Have I ever had someone who didn't want to be visit taught? Yes, but that doesn't mean they didn't want a friend. Have I had companions that didn't want to go visiting teaching? Sure, but I can still invite them when we go get frozen yogurt. How do I introduce myself to my visiting teachees? "Hi! I'm your new visiting teacher and I'm really excited to get to know you. Would you have time to go get ice cream sometime this week?" Be friends with your gals on Facebook. First and foremost. Immediately meet them. The longer you wait, the harder it is. Tell them your their visiting teacher, it's easier than pretending your not and you just called them up out of the blue. Can you be a visiting teacher if the lady you visit teach isn't LDS? Hopefully by now you can answer that question by now. Can you be friends with a person who isn't LDS? The other day I was telling a non-member friend about visiting teaching and she said, "That is really cool!" Amen. I followed up her comment with, "Would you like to be visit taught?" She said she'd love it. I really do think visiting teaching can solve a lot of the worlds problems. If we all just take more of an interest in the life and needs of others, large scale problems can also be solved. Also, you should listen to this podcast. 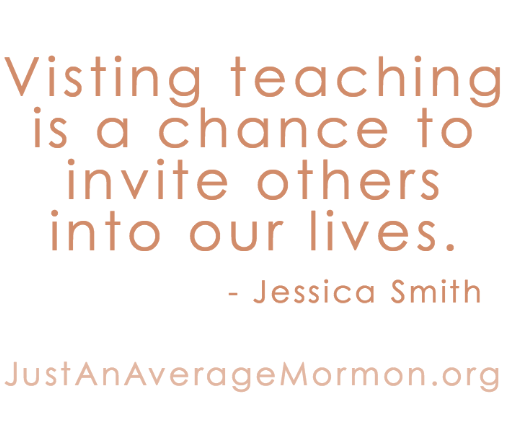 What blessings have you seen in your life from either being visit taught or through visiting teaching someone else? Thank you so much. I have been in a bit of a slump with my visiting teaching. Dreading it. not enjoying it, and even wishing we only had to do it 6 times a year. I totally benefited from your post. AND I'm so grateful you introduced me to that awesome podcast- in fact that whole series is so so awesome. I am totally turned around and going to step up my game in a major way. Thanks again for a great and very helpful post!